The Cheltenham Gold Cup is a prestigious race during the Cheltenham Festival and is one of the main highlights of the racing calendar. 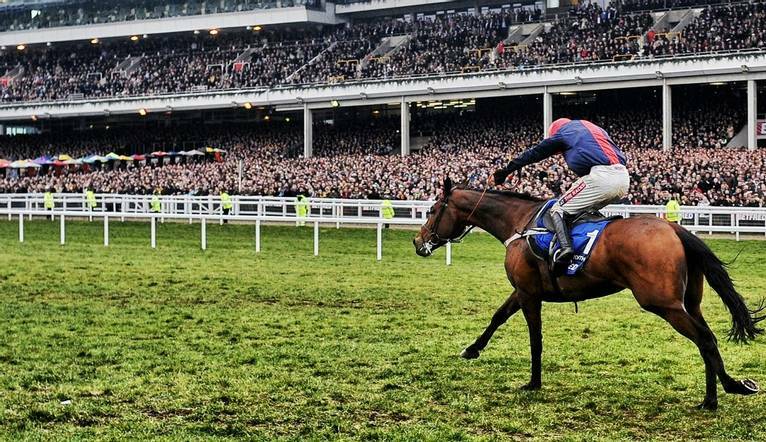 Take in the atmosphere of the Cheltenham Gold Cup and perhaps have a bit of a flutter! First ran as a steeplechase in 1924, the Cheltenham Gold Cup is the pinnacle of the jump racing season. Racing a distance of just over 3 miles and with 22 fences to jump, only the very best jockeys and horses have what it takes to win what is often referred to as the Blue Ribbon event of jump racing. Our tickets provide access to The Tattersalls Enclosure, this gives us a great choice of viewing and refreshment options as well as betting facilities if you fancy a flutter. These tickets also allow entry into the famous Parade Ring we can have a good look at the horses as well as giving access to some of the most wanted spots on the racecourse. The Shopping Village is a must visit with over 70 trade stands. Though there is no strict dress code in the enclosure, a trip to the races is always a good excuse to dress up. Based less than an hour from the race course, we join other race enthusiasts on Thursday evening where we can swap tips and discuss the horses form over a welcome drink and dinner before our day at the races on Friday. Then after an exciting day at Cheltenham, we return to the hotel where we can celebrate our wins and commiserate any losses over a farewell dinner. You may also like to take advantage of the hotels leisure facilities in your free time. Our stylish hotel is set in landscaped grounds and is in a good location in Bristol only 10 minutes from the M4, 15 minutes from the M5 and Bristol Parkway train station is also only 10 minutes away in a taxi. Facilities include a bar and restaurant as well as indoor swimming pool, gym and sauna in the leisure club. Car parking is complimentary at the hotel but you must register your car at check-in. Our modern classic rooms all offer satellite TV, mini bar, tea/coffee-making facilities, iron, hairdryer and complimentary Wi-Fi. The hotel is located off Junction 19 of the M4 and then from Junction 1 of the M32. Bristol Parkway Station is just 2 miles away. Car Parking is complimentary at the hotel but you must register your car at check-in. Our tickets provide access to The Tattersalls Enclosure, this gives us a great choice of viewing and refreshment options as well as betting facilities if you fancy a flutter. These tickets also allow entry into the famous Parade Ring we can have a good look at the horses as well as giving access to some of the most wanted spots on the racecourse. The Shopping Village is a must visit with over 70 trade stands. Though there is no strict dress code in the enclosure, a trip to the races is always a good excuse to dress up. The dress code for evenings is smart with gentlemen requested to wear a shirt and tie.